Stand perfectly still, close your eyes and you can feel it. The muddle of eight-bit sound effects, the chatter, the traffic streaming past outside, and the fog of cigarette smoke hovering like a storm cloud over the gamblers. Open your eyes and you’re in the loneliest room in the world. A bleached-out calendar hangs open on 11 March 2011; on the floor, plastic baskets and metal pachinko balls are scattered everywhere, forcing you to pick a careful path through the debris. The sense of loss and upheaval is palpable. You can taste it in the dank, cloying air. Outside the gambling parlor a kid’s bike lies on its side, now rusted through, perhaps in the same position it was tossed seven years ago when its owner dropped everything and bolted. Across the car park, a silver Audi A4 Avant—seemingly in perfect condition—is being consumed by the weeds, sucked back down into the earth from whence it came. This had started as a fairly last-minute, light-hearted idea. 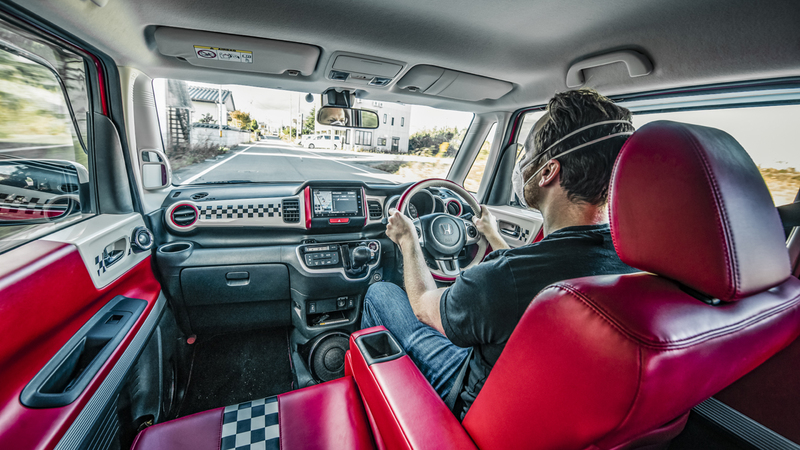 I was in Tokyo anyway, so why not ask Honda to lend us their silliest Kei car and take a three-hour road trip to the now partly open nuclear-exclusion zone surrounding the Fukushima Daiichi nuclear power station? 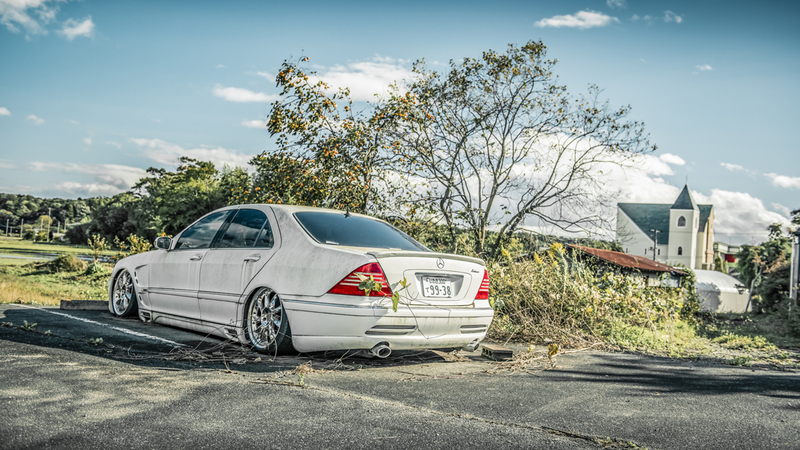 There had been reports and shots from a few intrepid photographers of abandoned vehicles everywhere, and given the depth of car culture in Japan, there was bound to be some interesting stuff left behind in the mass exodus. Our motives weren’t sinister or discourteous, but born of curiosity. Exactly six years after a magnitude 9.0 undersea earthquake caused a series of tsunamis up to 39m high that pummeled Japan’s northeastern coastline, flooded an area of 562 square kilometers, killed 16,000 people and wiped out the cooling systems for three nuclear reactors, sending them into meltdown and spewing radiation into the surrounding area, the government’s evacuation order was lifted. That was in March 2017. Former residents, in all but a handful of towns closest to the reactors, where radiation levels are still deemed unsafe, are being encouraged to move back, and £151m (over P10 billion) has been set aside to restore the healthcare system and other essential facilities. Despite the removal of housing subsidies to evacuees, worth around £640 (P44,000) a month to them, only around 15% have taken the government up on its offer. The science says it’s now safe, but you would you send your kids back to school here? Would you drink the water? The gambling hall in Tomioka is our first stop, and instantly shapes our mood. This doesn’t feel like bold exploration of somewhere few others have gone before; it feels like picking through the bones of real people’s lives. 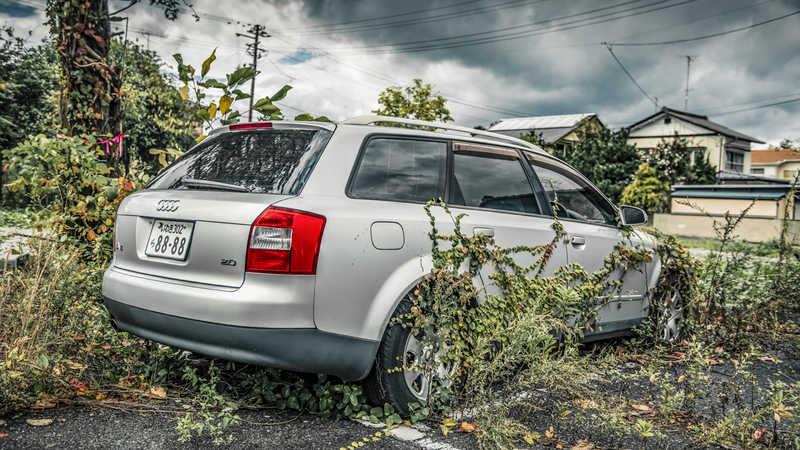 An abandoned Audi isn’t a finders keepers trophy, it’s someone else’s toil, left to the weeds because they had the sense to grasp that life is more precious than things. Above all, there’s a sense that today, as members of the human race, we’re duty-bound to show the utmost respect. Which brings me to our car. 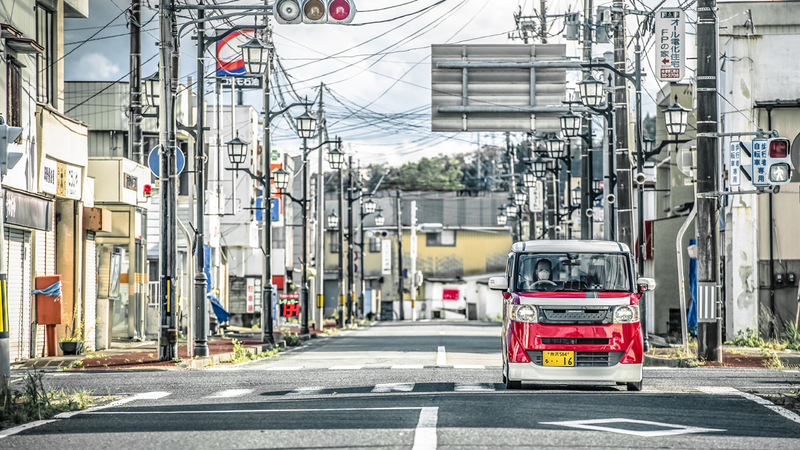 The Honda N Box Slash Mugen is peak Japan: a kei car cube on wheels embellished with a bodykit of questionable aerodynamic benefit, 16-inch spider-web wheels, sports suspension, dual exhaust, and decals inexplicably themed around "Muscle American Style." And before you ask, there’s nothing remotely muscular under the hood—it gets a 660cc 57hp triple. Earlier, as we wheezed our way out of Tokyo, it was a bit of a hit, probably getting more laughs than thumbs up, but still popular. Here, given the sobering atmosphere, it’s a bit of an embarrassment. Well, it would be if there were more people around to see us. Stick to National Route 6, the coast road that carves straight through the center of the exclusion zone, and besides the jumbo Geiger counters that line the roadside, the occasional sign for radioactive wild boar (a serious problem—the desolate towns were overrun with them until local hunters were drafted in to cull the numbers) and large sections with all exits blocked and guarded to restrict access into the red zone, and the traffic flow is fairly normal. Peel off into the towns open to the public, like Tomioka and Namie, and it’s clear that while the government is keen to invest, there’s little will from the people to repopulate. We drive along Namie’s main high street and find nothing but collapsed buildings and boarded-up shops. Occasionally another car passes; largely we’re left to our own devices. Rowan and I, normally keen on cracking jokes to pass the time, are both mute. Everywhere we look, poignant images stare back: a single forgotten bike at the train station, billboards for an election long since passed, vending machines not used or emptied since the ground shook and the great wave. 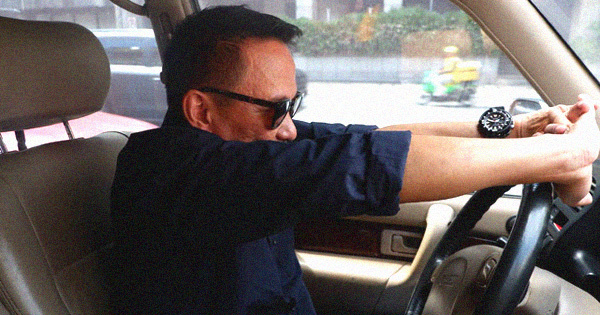 In Tomioka, we roll past an abandoned school, and the gravity of it all hits like a sledgehammer. Not so much the derelict building, but the lack of children… the absence of life. Just outside Tomioka, a field of black sacks piled as far as the eye can see, each filled with the contaminated top soil the government has been working for years to remove and make farming, once again, a realistic possibility. There are cars here and there, but strangely it’s not until we’re back on the busy Route 6, that we find anything of note. Our first meaningful encounter is a used-car dealership, the stock lined up with military precision, but the office long since deserted. 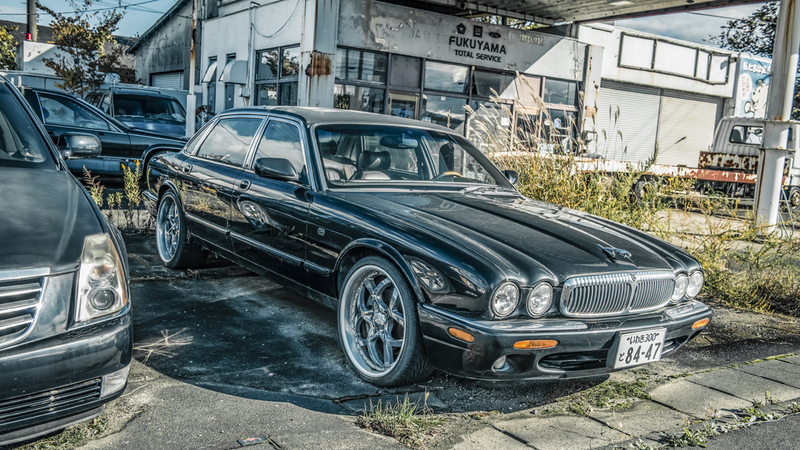 A Jaguar XJ on 20s with a pedestrian-piercing hood mascot, an old Cadillac and a beautifully crafted Buddhist hearse based on a Lincoln Town Car catch our eye, but the best is around the corner: a stanced Merc S-Class, stricken on its belly, the air suspension long since packed in. Soon, another car lot, obscured from the main road by long grass, so we pull off for a closer look. 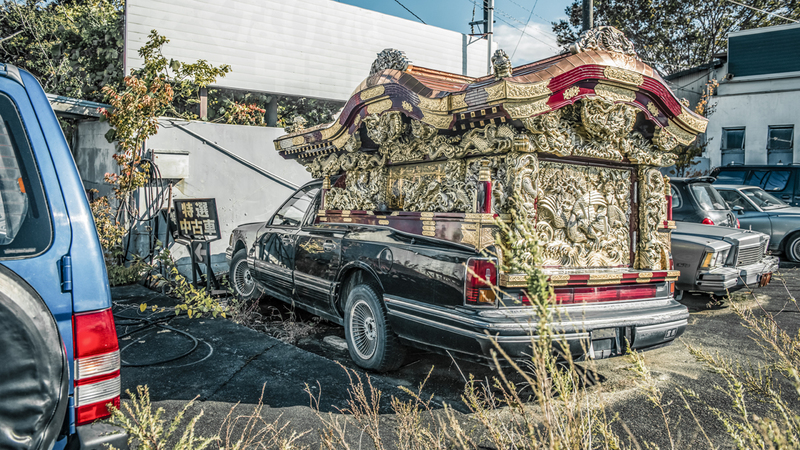 Another hearse and more American metal, but this time a stretched limo, an orange Chevy Impala SS with the door ajar that I can’t resist trying on for size and… a jet ski. Once upon a time, somebody’s pride and joy, now ornaments in a museum. Who knows? Maybe one day they’ll be claimed, perhaps they’ll be here in 100 years. It’s on our way south, back toward Tokyo, that I spot a British racing green Mini a long way from home, hidden behind a fence, surrounded by dense foliage. On closer inspection, it’s another sprawling forecourt sprinkled with unremarkable Japanese hatches and beige saloons. And then, a flash of white through the ivy. 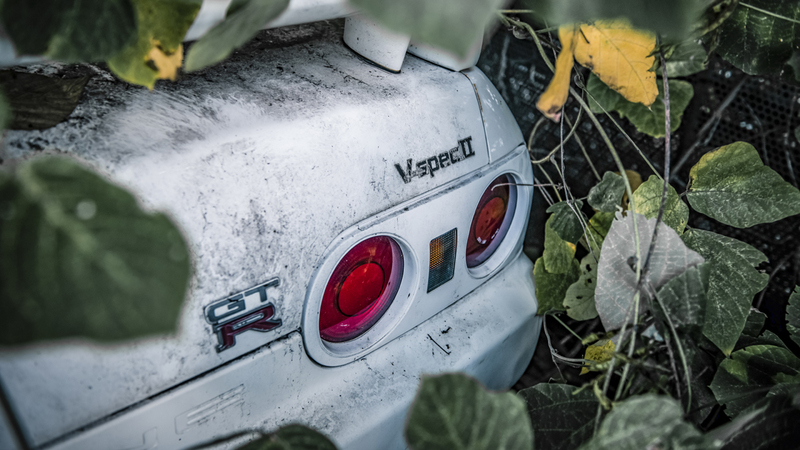 I climb in and wrestle the vines to one side, revealing a crystal-white R32 GT-R V-spec II. Not the most valuable GT-R, but still thousands worth left to rot, swallowed by the plant life. And next to it, for all you odd Japanese car name aficionados out there, a Mazda Bongo Friendee. On that victory, it’s clear our work here is done, so we leave. 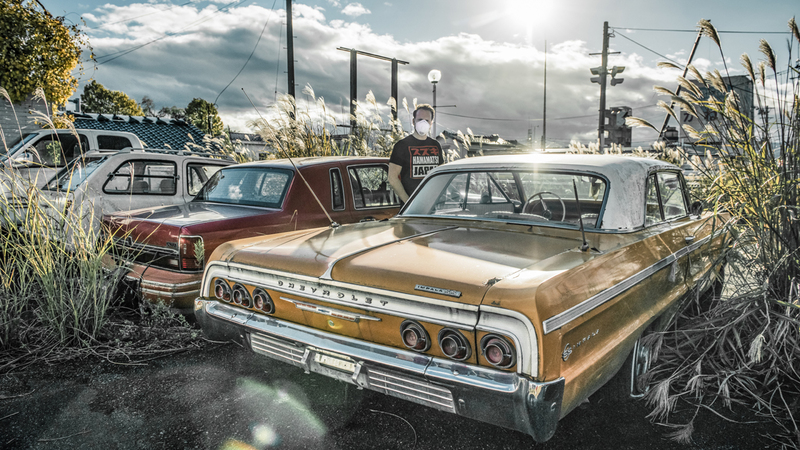 But not with a feeling of achievement for confirming that the Japanese have supreme taste in cars, but with a deep sense of sadness for the lives and livelihoods that this colossal natural disaster ripped apart in a moment. If you’re wondering whether any of this was safe, whether I should have been wearing a triple-lined space suit or placed in quarantine for a month, allow me to furnish you with some numbers. Using a fairly primitive smartphone Geiger counter, I gathered readings at various points in our journey. At the school in Tomioka it read 0.38Sv/h (micro Sieverts per hour, Sieverts being the unit of radiation exposure), a good indication of the average dose we were receiving. 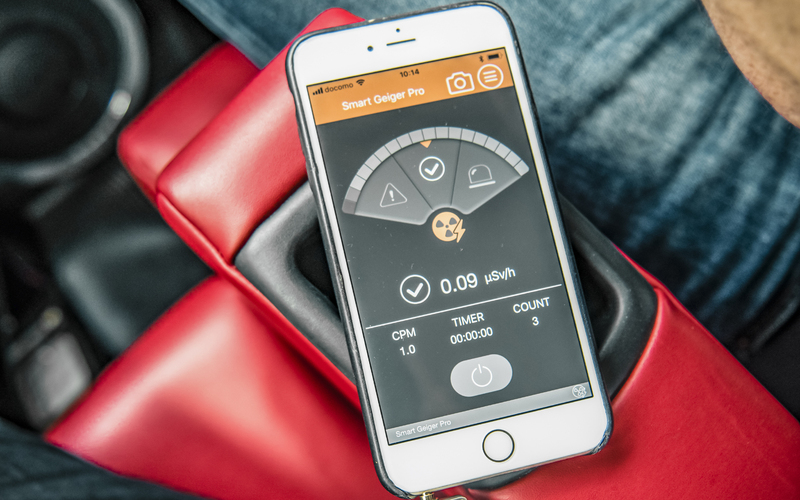 By comparison, Tokyo residents receive 0.04Sv/h. We were in the Fukushima area for five hours so we received a total dose of (0.38 x 5) 1.9Sv. If we were there for a whole year we’d receive a total of (0.38 x 24 x 365) 3,329Sv. Still with me? Good. By comparison, take a flight from NY to LA and you’ll receive a one-off dose of 40Sv, a mammogram is 3,000Sv, the maximum allowable yearly dose for a nuclear-plant worker is 50,000Sv, and it’s not until you receive 100,000Sv in a year that there’s a link to increased cancer risk. So you see, on paper, it is safe. The government isn’t trying to con anyone, but numbers on a page are one thing, peace of mind is another. If this whole episode teaches us anything, it’s that however deep we build our foundations and however robust the infrastructure appears to be, we’re all at the constant mercy of Mother Nature. As observed by novelist Jack London, walking the streets of San Francisco after the great quake in 1906: "The streets were humped into ridges and depressions, and piled with the debris of fallen walls. The steel rails were twisted into perpendicular and horizontal angles. The telephone and telegraph systems were disrupted. And the great water-mains had burst. All the shrewd contrivances and safeguards of man had been thrown out of gear by 30 seconds’ twitching of the earth crust." NOTE: This article first appeared on Top Gear magazine. Minor edits have been made.